Football is based on the ethos of the “level playing field” to guarantee equality of competition. What matters is the ability to play and not nationality, origin, gender, religion or sexual orientation. This basic principle of equality becomes increasingly visible in the line-up of many professional football clubs and within European national teams, too. Unfortunately racism and xenophobia still occur on a weekly basis in national and European football competitions. Racist abuse and slanders of players by other players, by football supporters inside and outside the stadiums, as well as the presence of far-right organisations, trying to infiltrate fan scenes, are still part of football. In several new EU member states racist abuses of black or Roma players, as well as anti-Semitic acts are still at a critical level. In addition, homophobic chants and symbols can be considered an integral part of football in several countries. Alongside these open forms of discrimination, there is a whole host of more subtle types of racism usually termed institutionalized or structural racism. Examples include the systematic under-representation of migrants and minorities in football administration, management, coaching, as fans in stadiums and – in some countries – as players in professional leagues. These forms of racism and homophobia are hardly regarded as a problem to be tackled. Discrimination based on sexual orientation poses a big problem in sport and in football in particular. Performing professional sport and being a successful athlete while being gay are usually seen as a total contradiction. This kind of casual homophobia has traditionally permeated professional football throughout the administrative, coaching and playing levels of the game. Homophobia in football is carried by invisibility. On one hand there is not a single male player in the European professional leagues who is openly gay; on the other hand it is a common prejudice that female players are stigmatized as ‘all lesbians’. European wide 'gay' has become a synonym for everything many fans dislike. The project Football for Equality– Challenging racist and homophobic stereotypes in and through football is a European initiative carried out by various partner organisations of the Football Against Racism in Europe (FARE) network and led by FairPlay-VIDC in Vienna . The project kicked off in November 2009 and will be continued until June 2011. The initiative is part-funded by the Fundamental Rights and Citizenship programme of the European Commission. External Evaluation of the project "Football for Equality - Challenging racism and homophobia across Europe"
In many countries, actions against homophobia in football were taken which followed the device of the FARE Action Week: “Be Visible”. In the course of the project “Football for Equality” Sensitisation Workshops were organised to broach the issues of discrimination, integration and stereotypes. An internet tool-kit collects information about this issues for the youth. 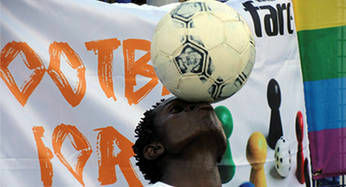 The Football for Equality I (FfE I) project ended in May 2011. Read some parts of the external Evaluation made by the social scientist and football expert Nicole Selmer.